Have a dog who deserves an extra special treat? 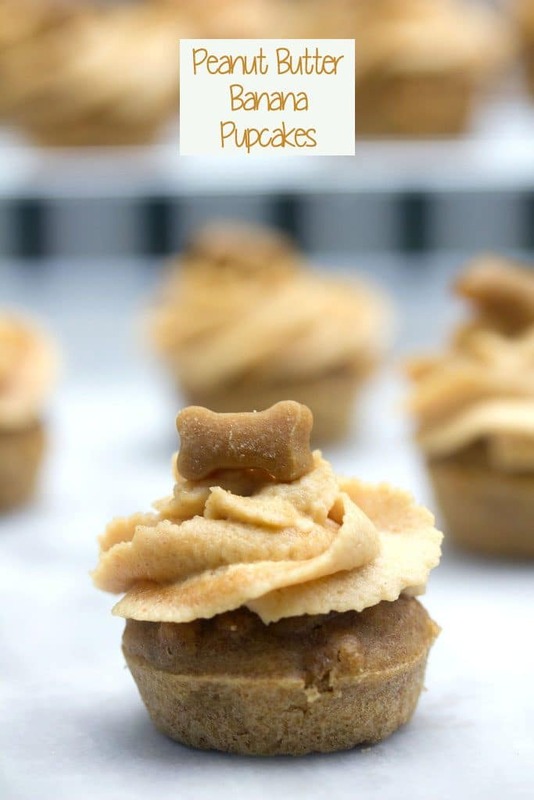 These Peanut Butter Banana Pupcakes (cupcakes for dogs!) will have your dog going wild! All of the ingredients are human-grade, so you can enjoy them, too. We had pick of the litter and we’re so glad we chose her! Now she’s a whopping 19 pounds and celebrating her 1st birthday in style. And with delicious homemade pupcakes. But then later that evening, she was all about it! In honor of her birthday, I decided to make her a special treat, in the form of homemade pupcakes! 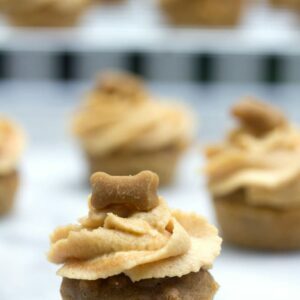 These cupcakes for dogs are filled with peanut butter and banana and topped with a delightful (if I do say so myself!) peanut butter cream cheese frosting. Seriously though, all the ingredients are human grade, but also dog friendly. Of course, every dog reacts differently (and some can’t do dairy), so check with your vet if you have any questions! 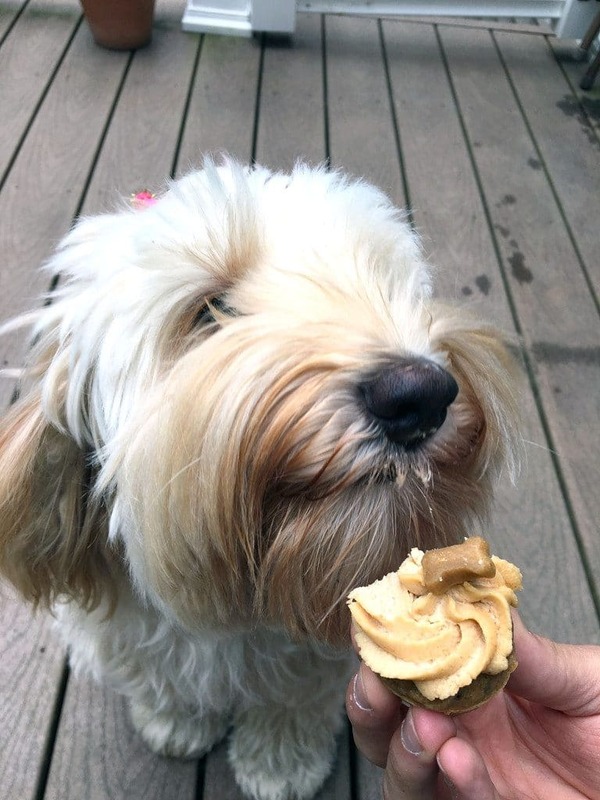 The pupcakes are mini and had just a dollop of frosting… And we let little Winnie indulge a little bit too much. I was just so happy that she was a fan. This dog has been known to turn her nose up at treats, so I wasn’t so sure she’d be all about the pupcakes. Not sure why I felt like I needed validation from my dog, but I guess I did! Ha! 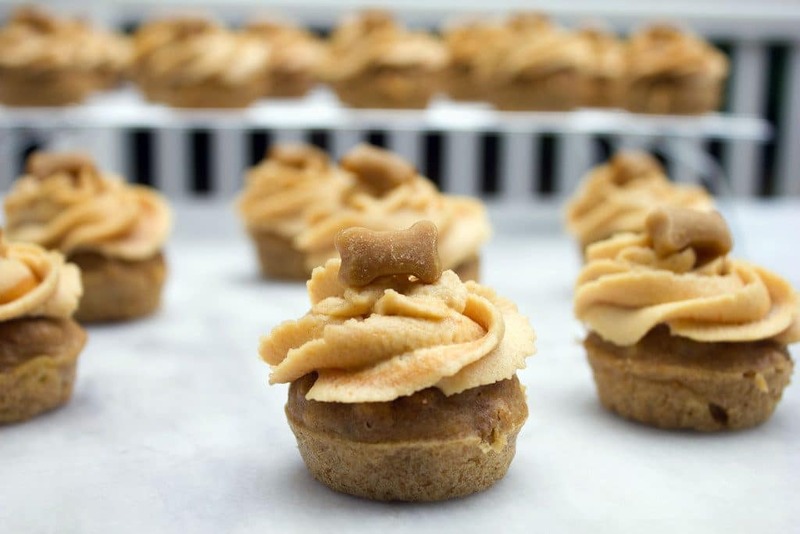 But seriously, if you have a treat-motivated dog and are celebrating a special day, I highly recommend these peanut butter banana pupcakes. I can’t guarantee your dog will thank you… But I think his or her face will probably say it all! 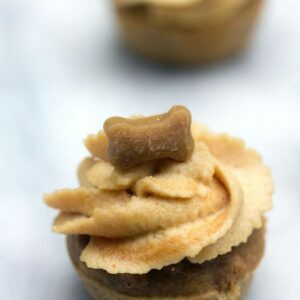 I’ve actually made these a couple times since her birthday party and even her super picky dog cousin Mitzi is a fan of these peanut butter pupcakes! 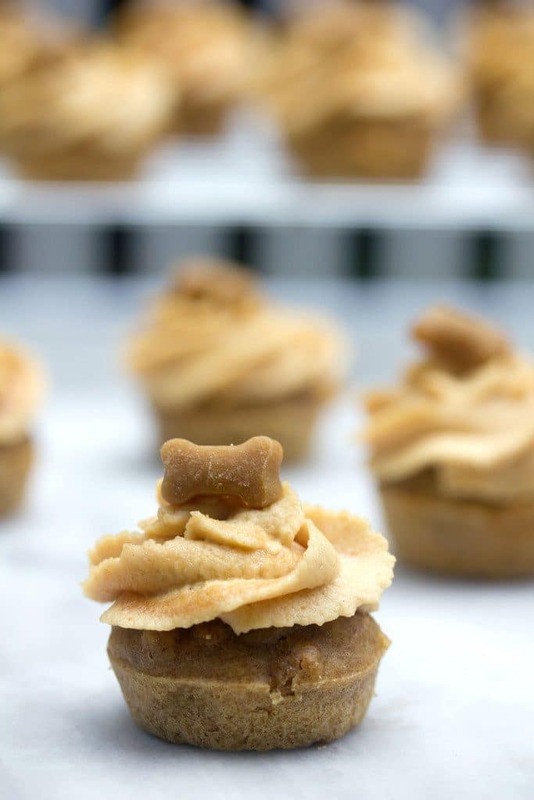 And if you happen to have guests over who are in the mood for a little treat… these pupcakes are actually pretty good! There’s no added sugar or salt in them, but the banana and peanut butter flavors are in full force. We are so, so lucky to have this little fluffball of happiness in our lives. It sounds so cheesy, but she really does add so much love to our world. Whenever I look at her little expressive face or I wake up snuggling her, I feel like I’m going to burst. I know everyone thinks their pup is the best, but I’m pretty sure ours actually is! 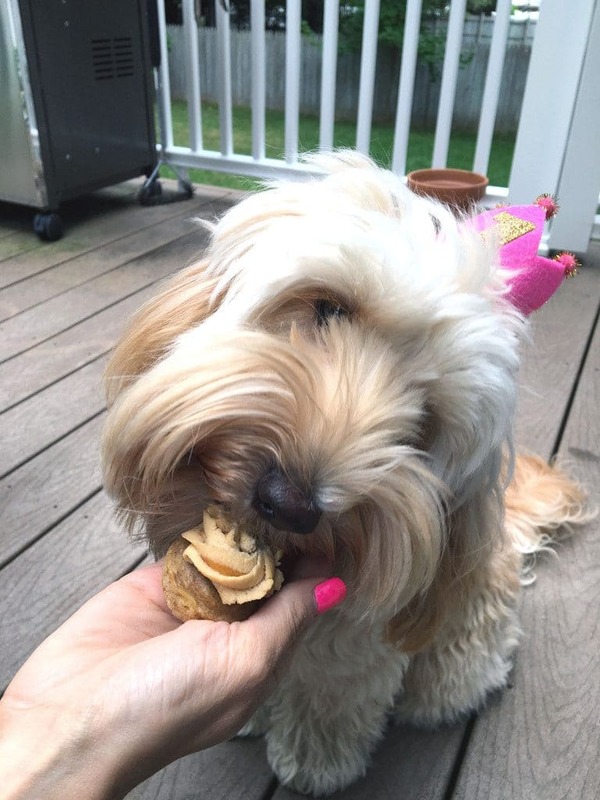 57 Responses to "Peanut Butter Banana Pupcakes"
Happy 1st Birthday, Miss Winnie! ??? 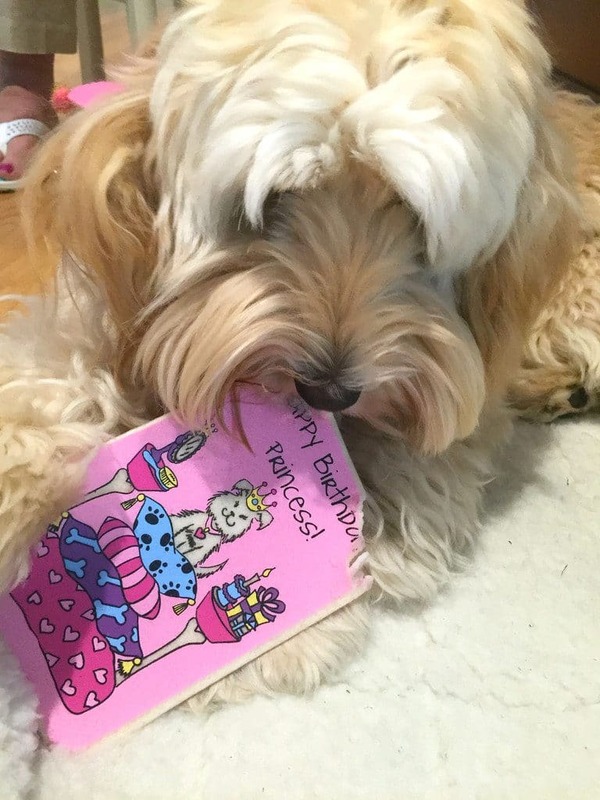 Happy birthday to your pup! She is adorable! And these cupcakes…wow. Peanut butter and banana is pretty much the best combo ever. Wish I these for breakfast! Oh man…totally bookmarking this for future use. My dog would love them!! Happy birthday Winnie :). Yay! I love seeing your Puppy celebration! Winnie’s face DOES say it all! Happy birthday! Happy birthday Winnie! You are such a wonderful, thoughtful dog mama. She is so lucky to have you and your amazing baking talents! I wish that people were as faithful as dogs. Okay! 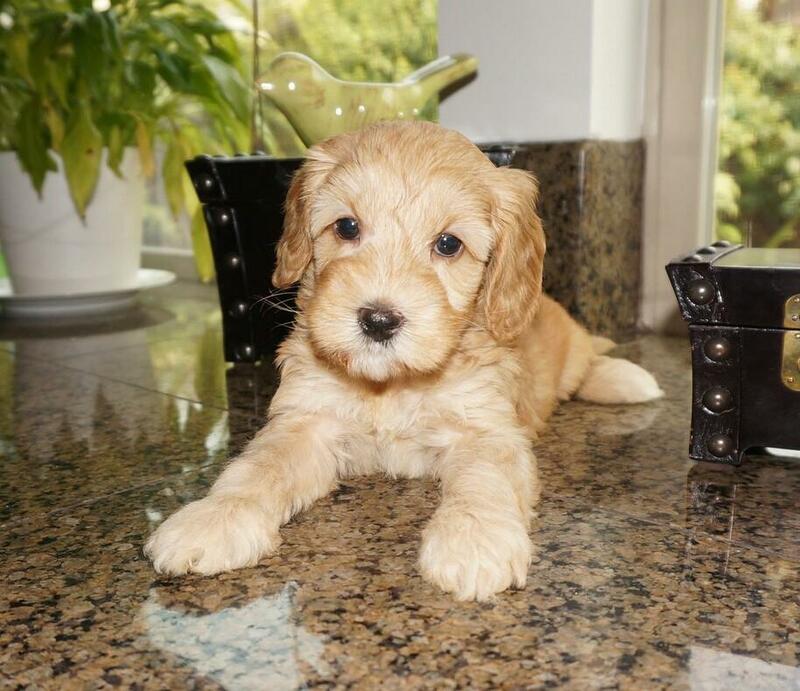 How adorable is Winnie! I love her name, BTW! 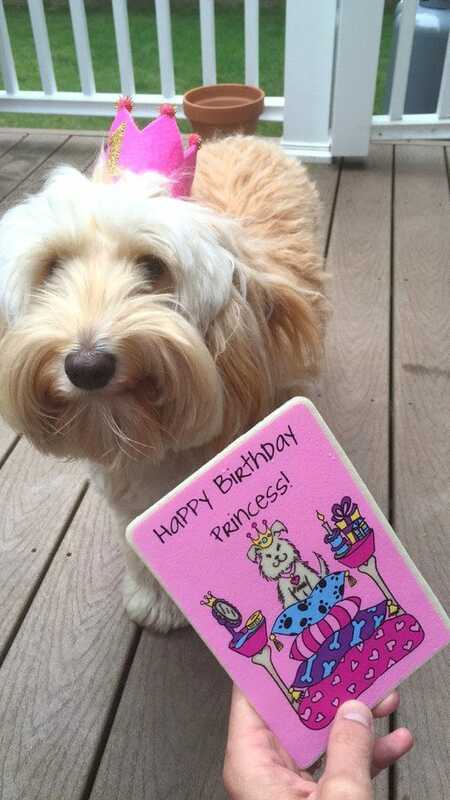 We got a puppy a few months ago and Winnie was one of the names we were leaning toward – but Dolce won out in the end… These treats are so cute – I’ll have to make them for Dolce on her big day in October! Adorable post!! Happy birthday to lovely Winnie! He must have been really happy on her birthday with those yummy pupcakes from you. Thanks so much for sharing! Happy birthday WinWin! Can’t believe she’s already one! 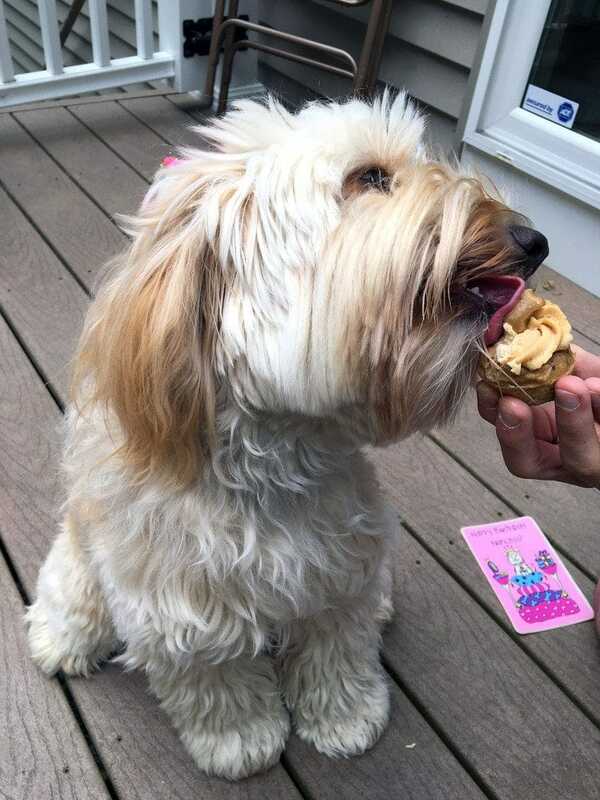 She is the most adorbs dog ever and is seriously loving the pupcakes! The most lovely dog ever and the most lovely cupcakes ever! 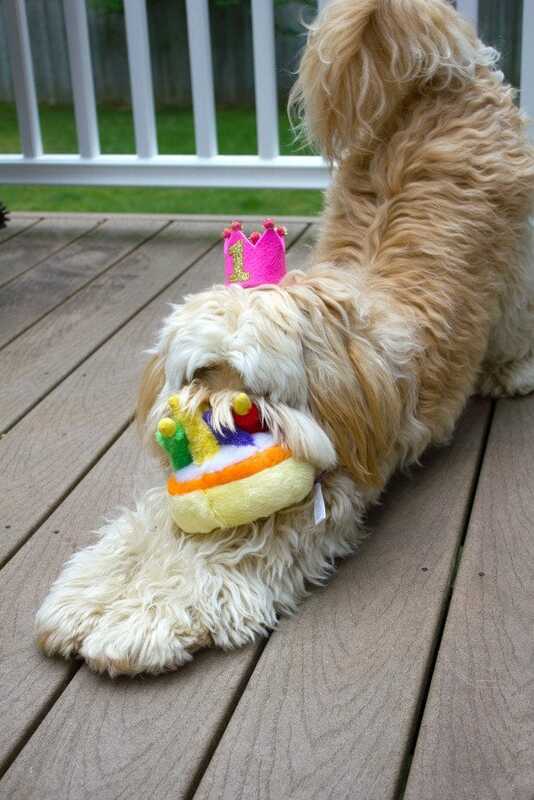 Happy 1st birthday to your puppy! The most adorable puppy and the most cute cupcake I’ve ever seen. I am going to make these pup cakes for Roxi’s birthday in November. I will let you know if all her doggie friends like them. We made these tonight for our pups, Nala and Chewie, who turned 1 today! Their pack pals, Josie and Pacho, are taking part in the festivities. 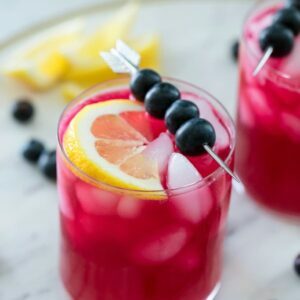 What a great, quick recipe! In the oven as I type this. Made small cake instead of cupcakes. I’m assuming that the baking time would be a good amount longer? @Lauren- Hi! Sorry for my late response, but yes 🙂 Exactly how much longer depends on the size of the cake, but I hope this worked for you! These were really good! Think I shoulda added a little bit of sugar to some of it, but o well!! 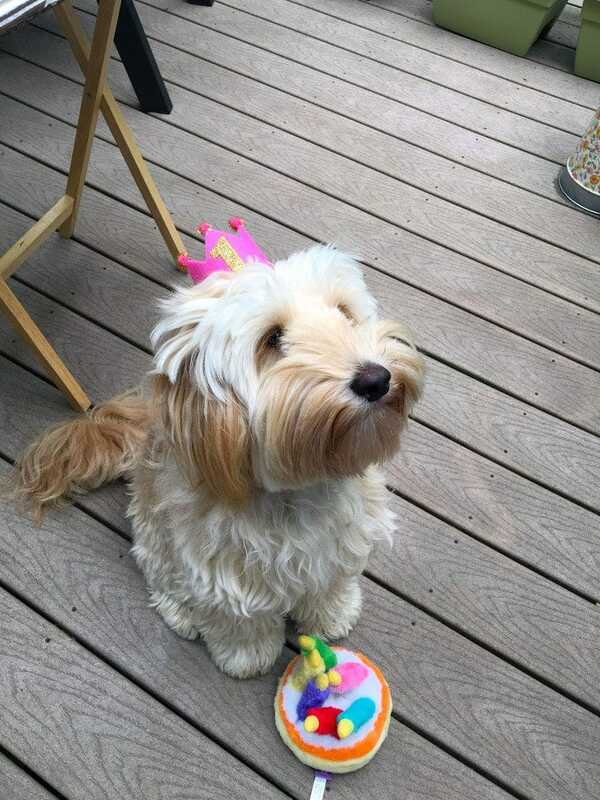 I wish I could post the photo, my Lulu just turned 2 today! And really liked these also! Thank you for the recipe! 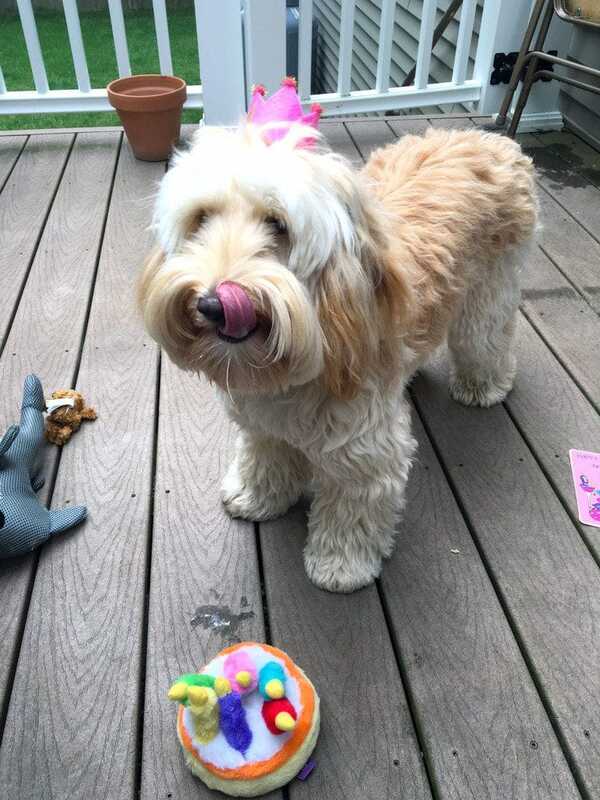 My li’l Lola turns ONE on St. Patrick’s Day and I’ve been looking for the perfect pupcake recipe. Looks like this is it! Thanks for sharing! She is a Beautiful baby girl! She looks like a very happy girl.. I will be making these for my Boston terrier Busters 1st birthday in April. He will share these with his Frenchie big sister Rosie. 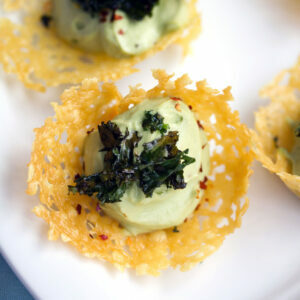 I will be making these tonight or in the am for our “Granddoggies” 2nd Birthday! Thanks for posting. I am making these for my little Gabbie’s 12th birthday tomorrow. I bet she is going to enjoy them. Happy birthday to cute Winnie! 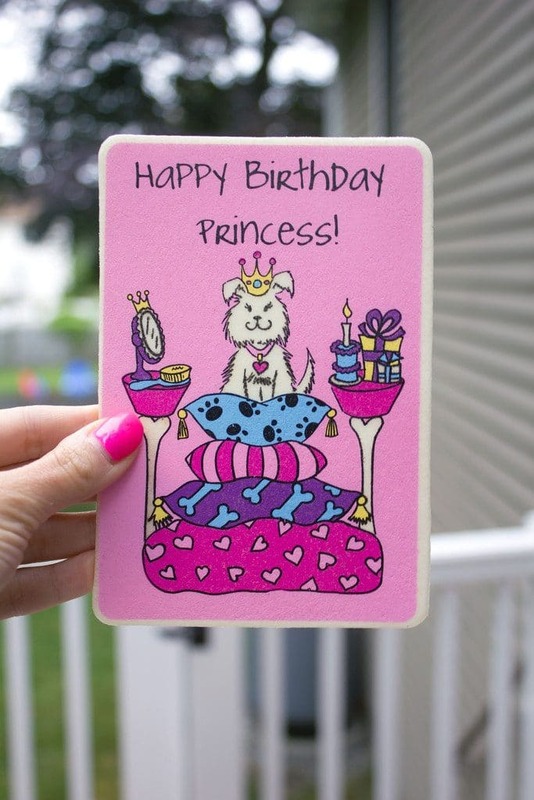 Have you prepared a gift for your upcoming birthday? My Jack Russell is 15 today and I’m making these for him! Thanks for the great idea!! Happy birthday Winnie! 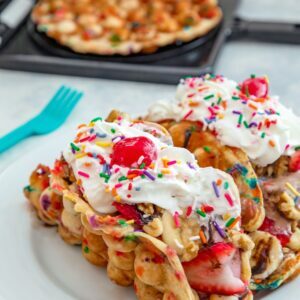 I saw this recipient and I had to try it my dogs 5th birthday is in two days and this definitely will make him the happiest up in the word thanks for sharing this recipe. I added honey to both mixes, I think he loved it! I added honey to both mixes, I think he will loved it! Making these for my Maxwell’s 2nd birthday tomorrow!! Is it just me or are others getting WAY more than 24 minis out of the recipe?!?! I have enough to do almost 48!!! Can’t wait for Maxwell and his friends to try them!! I hope Maxwell and his friends love them!! I only got 24 in the several times I’ve made them, but maybe yours are extra mini?? Happy birthday to Maxwell! Thanks for sharing the recipe! Can’t wait to make them for my dog’s birthday this month. I made this and they turned out well (dog approved! ), but I couldn’t get the icing to pipe. My kitchen was a disaster as I added more peanut butter, which didn’t help, then unsweetened almond milk bit by bit–but nothing worked. After adding the almond milk I was able to easily spread the icing–that had a whipped consistency by that time–on the pupcakes, but it wouldn’t pipe. My dog loved it all the same, but I was disappointed. Any suggestions for next time? What a cute idea. You have an adorable puppy!! We had a collie who would have loved this pancakes. She was such a member of the family. Any puppy would love the treat! She is the cutest thing ever!! Now, you need to come up with some cat treats for my kitties! 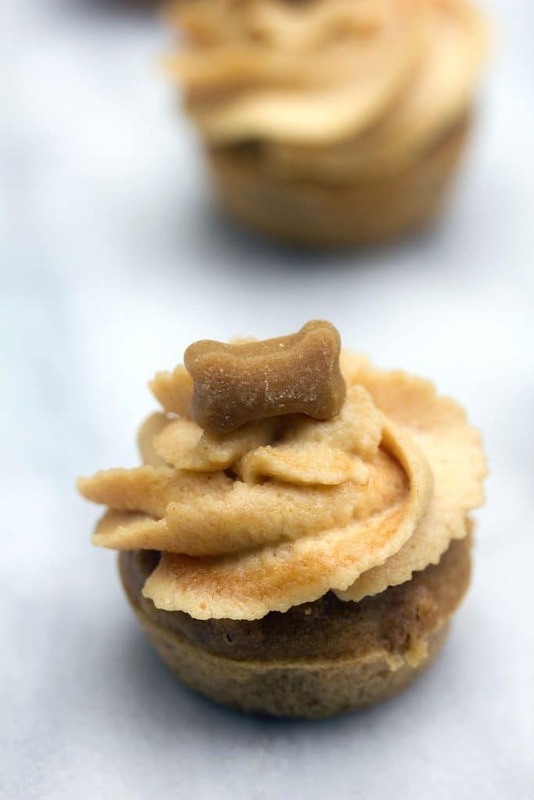 Hi, thanks for this awesome recipe, we will be adding it to our Doggie Party Cupcake Toppers Listing so our customers can enjoy these delicious goodies for their puppers! it is my dogs birthday wish sniper a good 1st birthday. @Caili- Happy birthday to Sniper!! Thank you for the recipe! My girls 1st birthday is Thursday and she’ll be spending it with friends at doggy daycare. With a busy week at work would making and storing in the fridge for a couple days before be okay? @Shauna- Yes, this should be totally fine! We always keep these in our fridge for a few days since I can only give my pup so many at once 🙂 Happy 1st birthday to your girl!! Cooper turned 2 today so I made this recipe. I put carrot shreddings on top along with frozen blueberrys. He loved it!